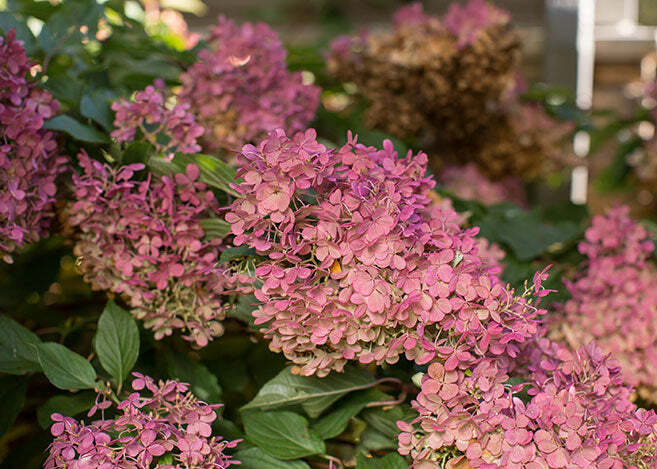 It's the heat of summer and while those spring hydrangea flowers are a distant memory, there is a hydrangea that will be the show stopper for your summer garden. It is Hydrangea paniculata (panicle hydrangea) with its midsummer extravaganza of blooms. 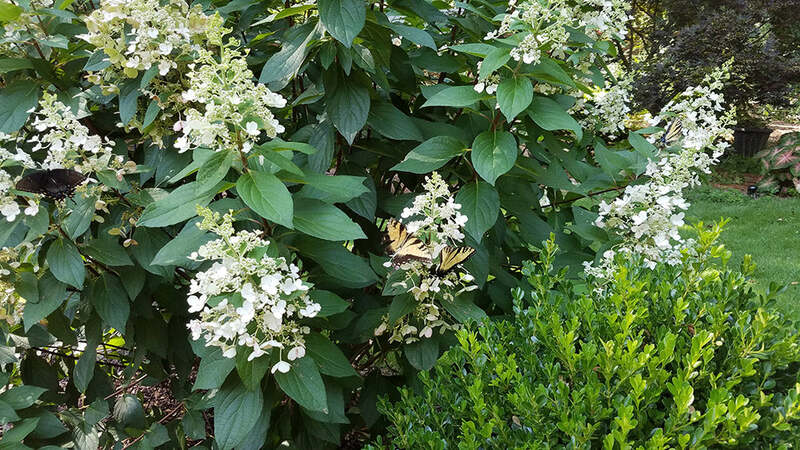 Give it plenty of sun and it will reward you with creamy white, conical-shaped blooms that will have all your neighbors and the neighborhood pollinators gathering for a paniculata party! Hydrangea paniculata is sometimes called PeeGee hydrangea which is short for Hydrangea paniculata 'Grandiflora'. It is quite a mouthful and PeeGee is much easier to say and write. Many years ago, as a gardening newbie, I purchased a hydrangea labeled PeeGee and was sure this was a “pee wee” hydrangea and it would not get very big. Au contraire . . . some paniculata hydrangeas can get very large! I also believed that all hydrangeas liked shade and was wondering why my “pee wee” wasn’t blooming in the shadier location it was planted. (To my defense, this was the before the age of the internet and smart phones and every tidbit of information at your fingertips!) I learned that Hydrangea paniculata breaks the rules and is a bit of a sun goddess. So, we know that it likes sun and blooms in the summer but it’s also a hardy lot, thriving in zones 3 to 9. In the North it likes full sun but in the hotter climates it appreciates some shade in the hottest part of the day (as most plants do in the South). As an added benefit, the creamy blooms will glow in your evening garden. Paniculatas bloom on new wood so late freezes are not an issue. If you need to prune, you will want to cut it back in late winter, early spring. Depending on the size, you can cut it back to 1 to 3 ft (larger varieties). Yes, it will grow a lot of new wood in a single season so don’t be afraid to prune back! Do I Have to Prune My Hydrangea? The flower form is generally a cone shape (botanically called a panicle). Some flower forms have the sterile flowers held tightly together in the cone (i.e. Vanilla Strawberry or Bobo). I love this flower form for cut flowers and drying. Some forms have more open cones where the sterile flowers are not held close together and the tiny fertile flowers are easily accessible to the pollinators (i.e. Chantilly Lace, Crystal Chandelier, or Pinky Winky). I have always been amazed at the number of butterflies that come to visit my Pinky Winky at any one time! Three butterflies feeding on Pinky Winky. Panicle hydrangeas with open cones like this are better pollinator plants than those with tight cones because the pollinating insects can get to the fertile flowers. Photo courtesy of Mariana DiVita. Although the flowers are creamy white on paniculatas, many age to a beautiful rosy pink (especially in zones 7a and lower - where nighttime temps are cooler) and give you an extended bloom into fall. Rosy pink flowers of Strawberry Sundae. They age from white in midsummer to this deep color later in the summer. Photo courtesy of Bailey Nurseries photostock collection. So now that you are sold on planting one of these beautiful shrubs in your yard, which one will it be? Well my first suggestion is to determine where you will plant this shrub. As I have said, some varieties can get quite large (8 to 10 ft tall) and very wide. It can be an impressive focal point, an anchor on the corner of the house, or plant several as a hedge. There are also mid size (4 to 5 feet) and there are some for the smaller gardens that grow to 3 feet. 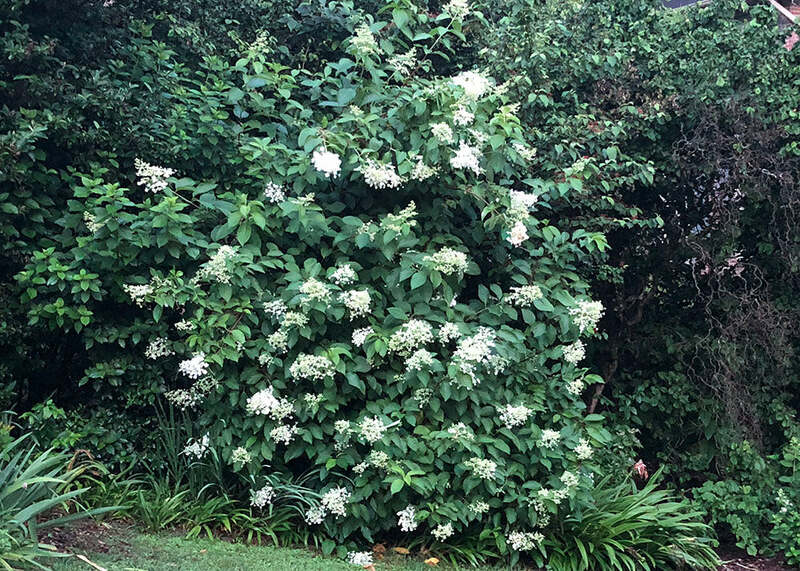 Unfortunately I can’t list every paniculata available on the market but you can start right here on this website to see pictures of the beautiful paniculatas you can grow in your yard. I bet next summer you will be back for more of these amazing shrubs! Again, we asked Mariana DiVita to explain hydrangeas because we love her words, facts, and clarity. Mariana is a hydrangea expert and Master Gardener from Cherokee County, Georgia. We love every panicle hydrangea Mariana mentions, but grow only four of them, as linked within the text. The reason we're not growing the other forms is they are more easy to find in local garden centers. Even though we don't have them, we endorse them as good plants!